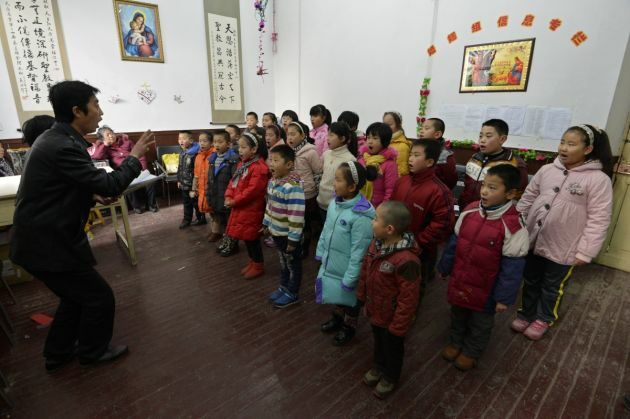 (Photo: Reuters / Stringer)A Catholic priest teaches children to sing a Christmas carol as they prepare for a Christmas Day performance at a Catholic church in Taiyuan, Shanxi province December 16, 2012. Contradictory actions and statements continue to cloud the stability of Chinese church houses in recent months. House churches, an unofficial form of religious worship for Christians that are not affiliated with the Chinese government, have maintained an ambiguous role in the lives of the faithful within the world's most populous nation. However, a missionary in China said recently that this is changing. Pastor Stephen Lei Chen, founder of Mission in China International (MICI), said last month that house churches have finally received "silent consent" from the central government. Chen, who was director of the Chinese branch of MICI until it merged with Gospel Operation International, has devoted much of his life to the missionary and ministry work in China and believes he is seeing a change in attitudes. While speaking with Chinese-American Christians at the New Jersey Missionary Council in April, he said, "As long as the [hidden] churches remain modest, inconspicuous, and neutral towards the government, then they will not be suppressed by the authorities. "On a certain level, the so-called persecution events towards Christian churches in mainland China no longer exist." However, while Chen speaks broadly about the central government's policy, house churches continue to be held with great suspicion in certain areas. Late last month, China Aid, a non-profit American Christian organization that monitors China, reported that respected U.S. Church Leader Dennis Balcombe was placed under house arrest at a church house meeting. His whereabouts are still unknown. Balcomb, a well-known minister in China, had been attending a church house meeting one morning in Nanyang, a city in the Henan Province, when police, accompanied by agents from Domestic Security Protection and the Religious Affairs Bureau, raided the event. Members of the church house, called Mt. Prayer Church, were detained for individual interrogation and fingerprints. All video and photographic equipment by the church's attendants was also confiscated. According to China Aid, as other Chinese practitioners were allowed to leave after questioning, Balcomb and his co-workers were last seen still being questioned under house arrest. This follows a trend in the Henan Province where seven house church leaders in the city of Pingdinshan were handed prison sentences of three to seven and a half years, including labor camps, on April 1. Chinese house churches have been spreading throughout China since their inception in 1949. They were created as a response to laws requiring that all religious organizations register under the People's Republic of China. Protestants are required to worship under the Three-Self Patriotic Movement (TSPM) or China Christian Council (CCC) while Catholics must worship through the Chinese Patriotic Catholic Association (CCPA) and the Chinese Catholic Bishops Council (CCBC). Christians who did not want their religious practices monitored and controlled by the Chinese government founded church houses. For that reason, they are not allowed to have official meeting spaces and gather in private homes for religious ceremonies. Roman Catholic Church houses are also of special significance, because they mostly recognize the authority of the Vatican, as opposed to the CCPA, which ignores Papal Supremacy due to its inherit challenge to the total authority of the People's Republic of China, as well as the Vatican qualifying as a nation-state. According to the Chinese government there are approximately 23.5 million Christians affiliated with the state-run churches. In contrast, China Aid reported in 2011 that there are a total of 130 million practicing Christians in China. While house churches were persecuted throughout the 20th century, including being outlawed in the 1950s and specifically targeted in the 1980s, they have become somewhat more tolerated in the last 20 years. There have been fewer cases of arrests and "reeducation" detentions since the 1990s, likely due to a pragmatic desire to avoid a mass mobilization of believers, similar to students in Tiananmen Square during 1989. However, the Christian minorities in the TSPM and CCC received new, heavy restrictions in 2008 in preparation for that year's Summer Olympics in Beijing. Also that year, 21 house church pastors in the Shandong Province were sent to labor camps before the international festivities. The role of independent house churches in Chinese life remains unclear.